30 October 2005: New York’s Fifth Avenue, Causeway Bay in Hong Kong and the Champs Elysées are the world’s most expensive shopping streets. 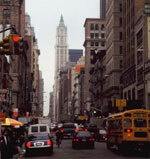 New York City shopping streets make up the top three places of the American top ten of most expensive locations. In addition to Fifth Avenue, the city boasts East 57th Street and Madison Avenue as prime retail streets. The European top ten of most expensive shopping streets is dominated by retail locations in London and Paris. The cost of retail space in the world's top shopping destinations has gone up by an average of eight per cent during 2004/05, with New York's Fifth Avenue being the world's most expensive shopping location, says Main Streets Across the World, an annual report by property consultant Cushman & Wakefield Healey & Baker (C&W/H&B). The international race for space is continuing unabated. A growing number of global brands are vying for limited space on the pavements of the world's top shopping destinations, whether Paris's Avenue des Champs Elysées or London's New Bond Street. This in turn is pushing up rents. Main Streets Across the World 2005 tracks retail rents in the world's top 237 shopping locations across 47 countries around the world. The report's global league table is drawn up by looking at the most expensive location in each of the countries monitored. "The hottest stretch of Fifth Avenue is north of 49th Street," said Gene Spiegelman, a director of Cushman & Wakefield in New York. "We are seeing luxury brands being joined by the popular fast-fashion brands, all in search of global brand recognition," he explained. The most notable arrival this year in Fifth Avenue is Abercrombie & Fitch, which has taken over the 470-square-metre Fendi unit at 720 Fifth Avenue, following on the heals of Zara's lease last year of its Fifth Avenue flagship store. Abercrombie & Fitch joins the likes of Louis Vuitton, Prada, Gucci and Asprey, alongside Gap and H&M. 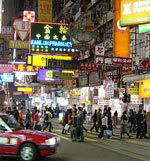 In second position in the world, after New York's Fifth Avenue, is Causeway Bay in Hong Kong, which in 2005 has leapfrogged Paris' Avenue des Champs Elysées. "Retail rents in Hong Kong have increased sharply on the back of an improved Asia economy, an influx of tourists from the rest of China, as well as recovery in visitor numbers from Europe and North America," said James Fisher, General Manager of Cushman & Wakefield's Hong Kong office. Only 18 locations out of the 237 monitored in Main Streets show a fall in rents in local currency terms, with the remainder either seeing rents stable or growing. On a regional basis, rents increased fastest in Asia Pacific, with Hong Kong's Causeway Bay recording 90 per cent growth year on year, followed by Tokyo’s Ginza district, a favourite with cross-border luxury brands. Some of the strongest rental growth has also been in São Paulo in Brazil, where the best shopping centres have recorded rental growth of up to 40 per cent. A healthy consumer demand is behind the strong performance of Brazil's retail sector. In terms of the sector's expansion and modernisation, shopping centres are leading the way, with cross-border retailers starting to line up to enter what is Latin America?s biggest economy. The biggest rental rises in Europe have been in Købmagergade in the Danish capital of Copenhagen, where rents have gone up 40 per cent in local currency terms. Outside the Nordic region, rents in Budapest's main Váci utca high street, Moscow's Novy Arbat Street and London's New Bond Street have all gone up 25 per cent when measured in local currency. Looking forward, David Hutchings, C&W/H&B's Head of Research, says: "Emerging markets such as China and India are the ones to watch as they start to dismantle barriers to foreign investment, and hence become more attractive to cross-border retailers and developers. In more developed markets, new developments coming on stream will not only improve the quality of retail space but also provide a greater choice for retailers and consumers."